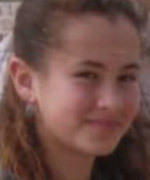 Jun 30, 2016 - Hallel Yaffa Ariel (13) of Kiriat Arba, was murdered in her bed when a 17-year-old Palestinian terrorist infiltrated her home and stabbed her to death. Hallel had attended a dance recital in Jerusalem the previous evening and had returned home late, which was why she was still in bed when the attacker infiltrated her house. She was in the 8th grade and attended the middle school in Kiryat Arba, and is survived by her parents and two younger sisters—Shira, 10, and Kanna, 4.5. Hallel was laid to rest in the Hebron cemetery on Thursday afternoon, June 30 2016.